Detailed figures with action features and electronic sounds. After learning some lessons at the hands of the jungle leader, Overhaul found greater strength in himself that he thought possible and morphed into the mighty Leobreaker. 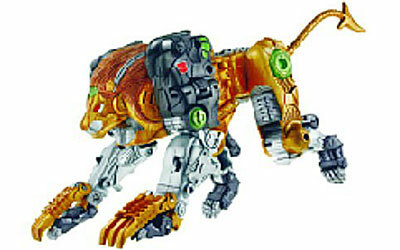 His new lion mode is nearly unstoppable, perfectly adapted to life on the Jungle Planet. Teamed up with the action figure inhabitants, he's determined to bring Transformers Cybertron freedom. Unlock the power. Change the heroic warrior from ferocious lion to Autobot hero and back again. Hear electronic roar sounds. His tail fends off opponents. Use the Cyber Planet Key to activate his robo claws, or convert for use with super Optimus Prime. Figure comes with key, planet map, and instructions.